As a tradition, the Passage greets the new year with a pearl post; today, the la-di-da pearl, South Seas. This is the variety that prompted one reader to say, "I didn't know what all of you saw in pearls, till you showed that South Sea strand." These are high-society pearls; I once stood next to a billionaire's wife in an astonishing strand of 20mm rounds interspersed with diamonds that was basically a Lamborghini on the neck. But a single South Sea ring or pendant can be yours for less than the price of a night on the town. Well, OK, a big night! Before we window shop, the obligatory pearl nerdiness. 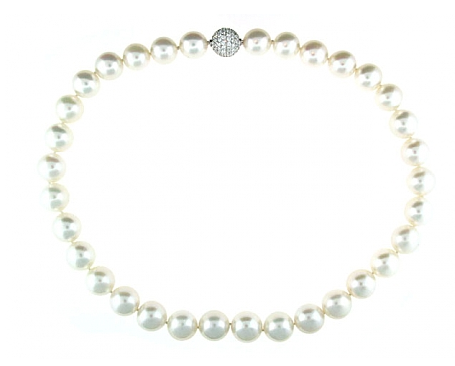 South Seas are the most valuable of the cultured pearls. (Tahitians are often grouped in the category—cultured saltwater pearls— but are grown in a different oyster, the pinctada margaratifera). The pinctada maxima, the oyster used to culture South Seas, is a big guy (sometimes the size of a frisbee) that comes in two varieties, silver-lipped and golden-lipped, hence the two colours of the pearls. That big oyster is implanted with a large bead for culturing; it then sits in clean, warm waters in the southern ocean from Australia to China, and lays down lavish nacre over two or more years (versus half the time for other cultured varieties.) The whites typically come from Australia and Indonesia, the yellows from Indonesia, the Philippines and Myanmar. The overall impression of a strand of large, matched South Seas is, Whoa, baby. They, along with Tahitians, are grande dame power pearls. Even as simple studs, the SS has the presence to match a Chanel dress, as worn by Christine Lagarde, at left. The vintage market is a good place to begin building your eye for two reasons: the price, while still not a casual purchase, is better, and South Seas, with their thick nacre, tend to hold up well, unless madame has been mean to them. While in Beverly Hills these pearls might be go-to-the-market attire, they are a bit much for many of us strolling through the Passage. But there are ways to wear the South Sea without a bodyguard. First, we step away from the world of rounds, to explore the less-formal shapes. Above, a stunning rope of South Seas (whites and goldens) and Tahitians from Hollis, Reh and Shariff (on 1st Dibs); price, $5,900. These pearls are various shapes, none of which are rounds, so the price is lower and the pearls read more bistro than boardroom. My South Sea strand (from Kojima Company), which I'm wearing on New Year's Eve in the photo, is of mixed shapes: discs, drops, off-rounds and baroques, with shimmering rose and blue undertones. This is an idiosyncratic, informal vibe for South Seas, and the pearls are not perfect; you will see some minor blemishes and light rings on a few, places where the oyster burped or the sea surged, the poetry of pearls. Therefore, the cost was but a fraction of the necklaces shown. Because of that charisma, a single South Sea pearl can delight all on its own. 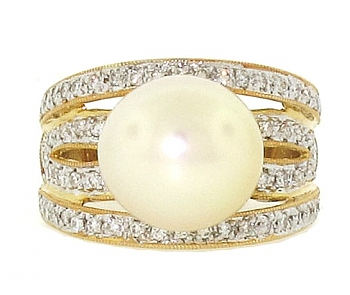 This ring, at Beladora, is such a piece, everyday-wearable yet fine: a 10.5mm South Sea pearl set in diamonds and platinum; price, $950. Another way to come to terms with the cost is to mix them with other varieties. Kojima Company's Sarah Canizzaro, unintimidated by the grandeur of South Seas, creates pieces that are especially free-spirited. Here, for example, are her company's lustrous Chinese freshwater ovals mixed with big baroque South Seas and natural colour punch-pink tourmaline beads, in a 40-inch endless rope; price, $630. Golden South Seas: an effective treatment for seasonal affective disorder! Since they can be dyed to deepen or enhance colour, ensure the colour is natural or that any treatment is disclosed. The deeper the gold, the more expensive the pearl. Classic studs or drops are lovely and luxe, but I am taken by a quirky pair of matched 10.8mm baroques, one white, one yellow, from the UK's Pearlesence; price, £80. 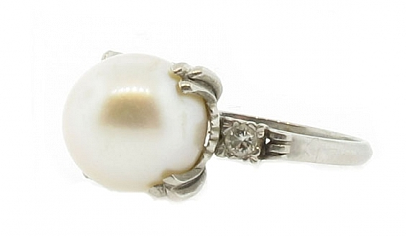 I look at pearls continually, whether museum treasures, jewelers' and artisans' offerings, auctions and books. From the mass-market vendors to the specialists, if it comes out of a mollusc, I want to see it. Currently I'm seeing a glut of bleached freshwater and Akoyas among the "fashion" jewelery lines, often sold at boutiques who sell branded jewelry, or in department stores. They are genuine, but neither organic-looking nor lively. A low-luster bleached-pearl necklace looks like a woman with an obvious face lift, too blandly perfect, no overtones, no character. I prefer even a subtly-dyed pearl (in a 'natural pearl' colour). Last year, I ordered several things from online pearl vendors, and kept two (the South Seas and a gift). Even the returned items were better value than those of the high-end department stores, and the service more knowledgeable. A number of readers asked me to provide an opinion about prospective purchases or renovating their unworn pearls; I enjoyed that! My advice to anyone interested in pearls (or any gem) is, keep reading (including dozens of archived posts here), looking and comparing prices. Reputable online vendors are happy to talk with you to supply more information. 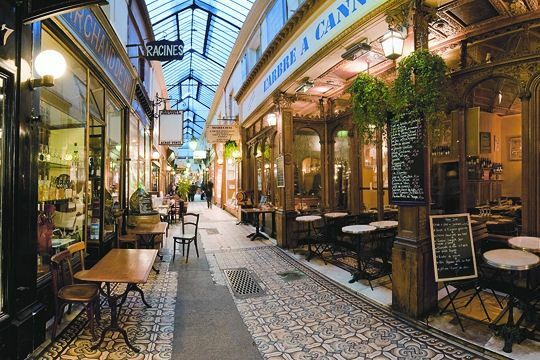 Then, should you too experience a coup de coeur, you will make a wise and satisfying decision. So beautiful, and so much information! Thank you, as always. Welcome back Duchesse! You've started off the new year with a WOW post. Those pearls...WOW. Even in photos you can see the glow; I can only imagine how they'd look up close. As always, your pearl posts are outstanding, thank you! 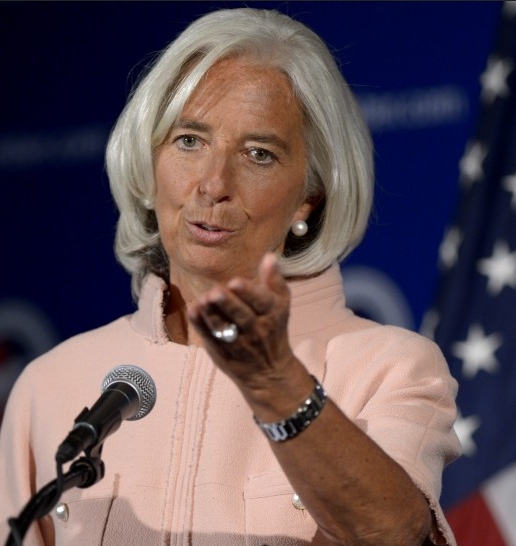 I think the pearl earrings are the most important element of Christine Lagarde's chic. Speaking of which--I'd kind of like (note hesitation!) some big pearl earrings for my upcoming b-day. I remember you said you had an Ebay (or other) source for some cheapish ones. I want to start on the low end because I find my desires are sometimes mistaken. Anyway, I'd appreciate some tips/sources if you have the time. Your pearl posts are always so enjoyable. I especially like the picture of you wearing your pearls, you look wonderful. The cautionary information about what's going on in the retail market / true value is very helpful, thanks for sharing your wealth of information and insight. As always your pearl post is a pleasure. You look fabulous in your pearls. I think they add such a nice glow, so much softer than diamonds but I would not say no to either should they be offered. frugal: Please contact me by e-mail so I can reply personally. Laura H: I have bought Andrew Goss and Sandra Noble Goss' work and given them as gifts for over 30 years- beautiful. 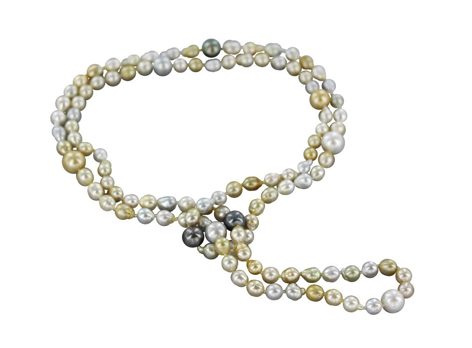 Your necklace is remarkable--the perfect length and shape for your face, each pearl apparently lit from within! Could anything be kinder to a woman's skin than that glow? Thanks for the info on bleaching. I had no idea. C.: That 'kindness' is why I recommend •genuine• pearls as an essential part of any woman's wardrobe. Argonite crystals (which form the nacre that supply that glow, and it is not equalled by imitations. How LUSH these pearls are - I would have dropped all pretense of civility and asked that wife to let me stare at her pearls for the entire night. I'll bet they're incredibly heavy, though, which is the one problem I have with larger pearls. However, I may start looking into a pair of South Sea drop earrings, or some bracelet rendition of the mixed pearls similar to the strands you've shown. What a way to launch 2014, Duchesse...you've got us all agog yet again! Pretty pearls! I'd love to be able to swank about in South Seas' pearls. I should have known you'ld be miles ahead of me! Beautiful pearls, and thank you for sharing all your insights. I do like those Lagarde earrings a whole lot. I truly enjoy reading your posts and drooling over all the gorgeous pearl pics you post! And, from one pearl lover to another, THANK YOU for always having accurate, trending and up to date info! Fabulous photo of your and your pearls too by the way! Best to you in 2014!! But, if you wanna wear 20mm SS gumballs, you will be carrying that weight. She seemed to be handling it! Beth: I've e-mailed links to my posts that address those sentimental strands. Often it just takes changing the clasp to make them look charming again. Cornelia: I sense a post on large pearl earrings shaping up! Shel: Always great to hear from another pearl lover, thank you! 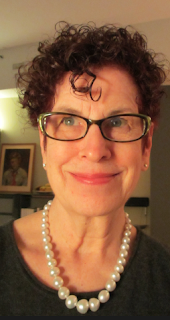 LauraH: There are probably many Ontario jewelers on the scene now and unknown to me, but they have been beloved for so long that I do know them. Eleanorjane: Are you in the UK? 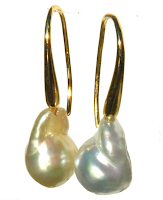 Pearlesence are showing some lovely SS earrings at £140-£180- a reasonable savings goal. hostess: A friend of mine is Harry Winston's goddaughter and the daughter of a prestige jeweler- that's all she wears: diamonds, pearls and gold. Thank you for this post. Fun to read and very informative. Thanks to you my husband has just found his Valentine's present to me- and I'm delighted! Love, love, love pearls. South Seas are the ones I do not have and I appreciate your informative posts, it gives me some confidence in seeking out new pearls to purchase. Hubs gave me Tahitian earrings for Christmas, he took the pearls are always welcome speech to heart. atthetableandinthegarden: I am guessing it is the SS/tourmaline rope as it is now s/o- lucky you! fmcg: That is a beautiful gift, and so is a partner who listens! Cathy Wong: As long as you deal with sites with a 30-day return (for full refund) policy, there is very minimal risk. I always use my Visa card which has loss insurance. The Chinese eBay vendors are another story, as communication is difficult and returns not easy. They mostly sell low end to average pearls. They come and go, or change names. Caveat emptor. 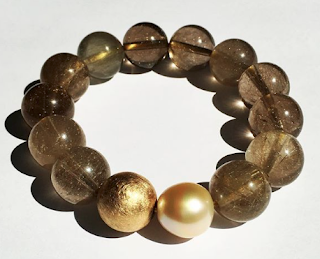 Carolyn Ehret (Ehret Design Gallery) is a reputable eBay vendor based in the US; she sells beautiful pearls, as well as high carat gold findings. Wow, those souffle pearls are pretty amazing, and what a unique process. I need to look into those as a serious possibility. 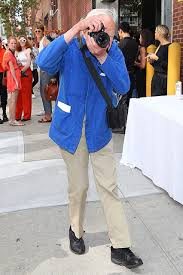 I hope you'll continue to source unique options for your readers (and I'm eagerly awaiting your Big Earring post...pun intended). THANKS for these tips-every bit helps. Gretchen; They are hard to find. Cathy Wong: No, we cannot! Carolyn Ehret uses particularly beautiful findings, often 22k. Thank you so much for the kind mention. It is nice to have my quirky matchings recognised and appreciated. Beautiful pearls, as always. Yours look stunning on you and love the way you both glow. Those earrings could push me finally to pierce my ears! Suddenly I get the "pearl thing." Love the ring but it is dressy and looks fragile. Hello! Thank you for your information..I recently aquired a south sea pearl necklace. It has 13mm off round pearls and it its beautiful! 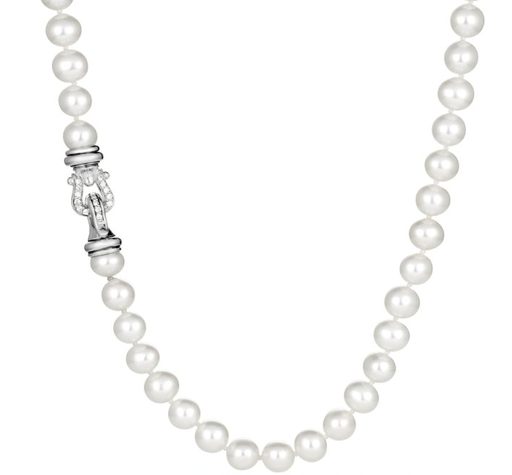 It has 36 pearls and a 14k gold clasp. I am trying to find out if they are natural pearls are cultured. Anyway, I am a bit confused at value. When searching, sometime, I see places online that sell them for 2,000 or not far from that price. Then there are sights that have them for 25,000 to upward of 90,000.. Could you please give me some info on that..I am going to try and Xray them to see if they are natural or cultured. Thanks so much!! Anon@2:08: Have them professionally appraised. The likelihood that they are natural is very much smaller than cultured. 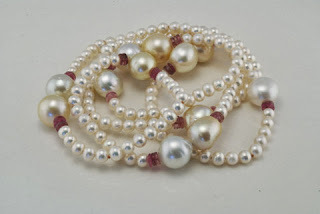 Other factors will affect the value: luster, whether there are blemishes on the surfaces of the pearls, the matching of the pearls in the strand,and of course size and shape. If yours are not new pearls, the wear is another factor, as pearls can be degraded by cosmetics and body oil or damaged by poor storage. Thanks soooooo much! Have a wonderful day!! Anon@12:00: I am not a qualified appraiser, which is a specialized, credentialed type of work. My area is helping people renovate what they have, or choose new or secondhand pieces. Below, I have pasted the link to the GIA's online directory of appraisal associations. Those associations will in turn have directories of appraisers in your area.